Scientists at the University of Michigan have found something really surprising and remarkable: wasps can recognize each other by looking at their faces. Until know, we thought that only animals like humans or chimps can do this. Not anymore. 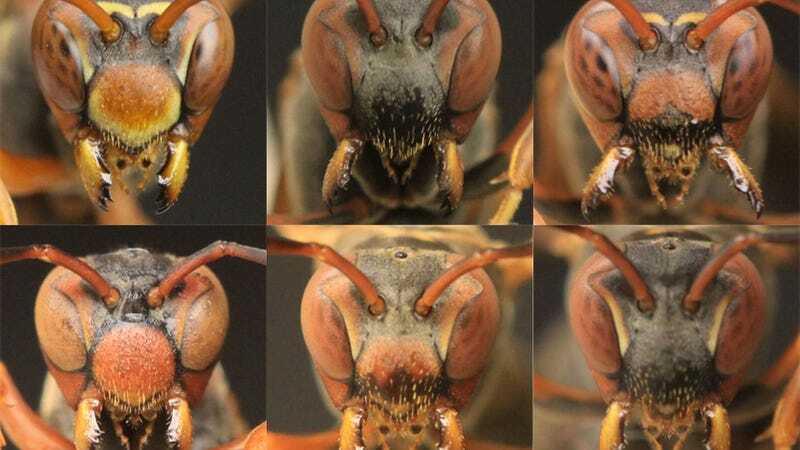 University of Michigan's evolutionary biologist Elizabeth Tibbetts and grad student Michael Sheehan have discovered that paper wasps exhibit the same facial recognition abilities that we have. According to Sheehan, it was shocking to find that a very primitive animal with very limited—although highly specialized—features can do the same. Wasps and humans have independently evolved similar and very specialized face-learning mechanisms, despite the fact that everything about the way we see and the way our brains are structured is different. That's surprising and sort of bizarre. It's also freaking me out. Would they be able to recognize your face? Most probably not. Like humans, they discovered that wasps have a hard time differentiating the faces of other species on first sight. Humans and wasps do it all the time with everyone around us, but have a harder time recognizing two different faces on other species. Tibbetts and Sheehan built a maze on the shape of a T. At the end of the two top arms they placed two photos, like two different wasp faces or two of caterpillars or simple geometric patterns. One image would be associated with a reward while the other won't. They discovered that the wasps had an easy time identifying the wasp faces that lead to the reward, unlike with the other image types. In fact, they also discovered that, when they photoshopped out the antennas on a wasp face or some other facial feature, the wasps' recognition ability would diminish. p.s. I know—between giant grasshoppers, yeti crabs and Siri, this is starting to feel like bugmodo. But this was too amazing to pass.